Get in shape for summer with our irresistible sliders! No better way to get ready for surf and sand than with a few simple modifications to your proteins. While this is an effortless inside job, you can freeze your extra patties and heat them up on the grill later on. For an “Eat the Rainbow” meal, pair it with the following sides: SAUTEED ZUCCHINI WITH GARDEN MINT, BASIL AND TOASTED PINE NUTS and RED QUINOA, GREENS, AVOCADO, LEMON AND PISTACHIOS. Enjoy! Plate salmon sliders atop market greens. Line a large platter with paper towels and set aside. Place salmon fillets on a lightly oiled rimmed baking sheet and season with salt and pepper. Bake for 15 – 18 minutes, until the salmon is medium-rare inside. Remove and cool. You can also use pre-cooked wild salmon fillets. Gently flake the salmon into large chunks with a fork in a large bowl. Add half of the whole grain breadcrumbs, mayonnaise, Dijon mustard, eggs, red onion, grated garlic, scallions, jalapeno, fresh basil, hot sauce, cayenne, salt and pepper. Stir ingredients just until mixed. The salmon chunks should be bite-sized. Using your hands, form the mixture into approximately two dozen bite-sized salmon sliders. Coat both sides with remaining breadcrumbs. Shake off any excess breadcrumbs. Heat oil over medium-high heat in a large skillet. Cook half the salmon sliders at a time for 2-3 minutes each side. Be careful not to burn and turn only once until both sides are golden brown. 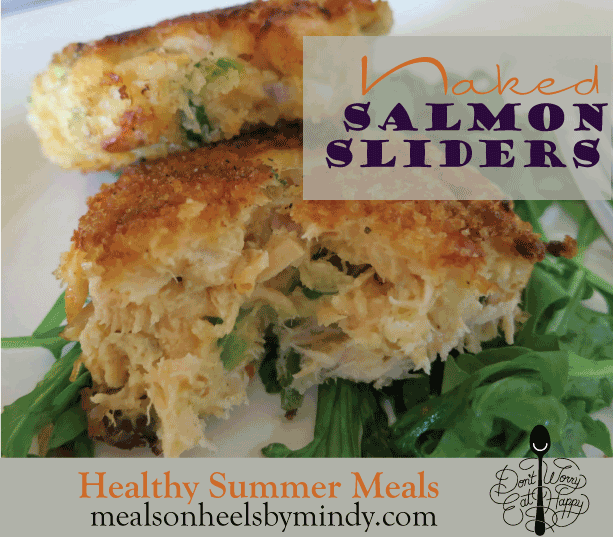 Remove salmon sliders from the skillet and place on lined platter to drain. Repeat process with remaining cakes. *To keep cooked salmon sliders warm between batches, transfer to a baking sheet and place them in a 200°F oven.